If I would have had greens, I would have dumped a handful of those in too. Watch the serving size. Especially with the fruit or you may be gulping way more calories than you think. 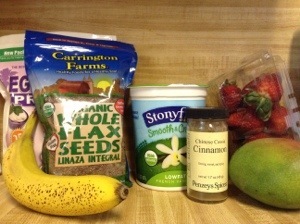 The entire blender has at least 292 calories, just from the fruit and flax, so portion it out! At my house, it makes 4 smoothies.